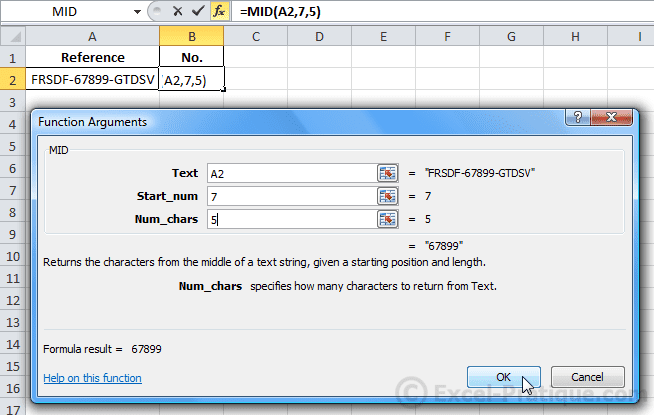 You can used the MID function to extract part of a text string starting from a specified point (of your choice). Cell A2 contains a reference. We want to extract the number (in the middle) and display it in B2. To do this, select the MID function from B2. In the "Text" field, enter the cell that contains the text string. In the "Start_num" field, enter the number of the first character to be extracted, and in the "Num_chars" field, the number of characters to extract (starting from "Start_num"). Click OK.